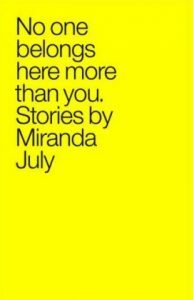 Miranda July boldly explores loneliness in her short story collection, No One Belongs Here More Than You. The sixteen stories feature quirky narrators conversationally depicting a moment of their lives with an acute self-awareness. At times explicit and at times bordering on creepy, the diverse collection is unexpected and eccentric, featuring anything from a swim class for the elderly on an apartment floor to forty women putting napkins over their heads at a romance seminar. Through all the stories, July’s writing is raw and highly quotable, bringing poetry to the ordinary.